Fineberg Management has two attractive buildings near Cleveland Circle at 1788 Beacon (16 units with limited on-premise parking) and 1822 Beacon (9 units a block away). Both are quiet, three-story brick structures with a tenant base of mainly professionals. 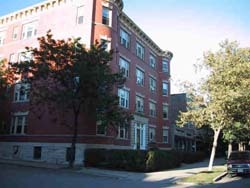 These apartments are located on a very broad stretch of Beacon Street in Brookline and near Cleveland Circle and are handy to Brookline parks, Brighton recreation fields, skating and swimming, the T’s Green Line and family shopping and services of all kinds. The neighborhood has a fair number of students and professionals as well as many long-time family residents, and the eclectic mixture makes it an interesting and active place to live.